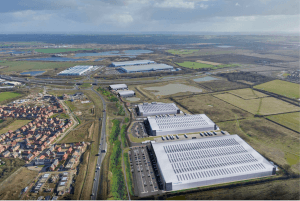 Adroit Real Estate Advisors (AREA) have been appointed joint letting agents at Bedford Link Logistics Park , a new speculative development by LondonMetric Property PLC & Graftongate. The scheme will deliver up to 700,000 sqft, including a single cross docked building of up to 425,000 sqft. Works are well advanced to complete the infrastructure following which a first phase of speculative development will begin and will provide three units of 32,000 sqft, 50,000 sqft and 106,000 sq ft which will be ready for occupier fit out by the end of the year. Lloyd Spencer, Director at Adroit Real Estate Advisors commented – “We are delighted to be appointed by LondonMetric and Graftongate. The scheme is being delivered at a time when supply along the corridor remains at a record low and occupiers are struggling to secure good quality, well located accommodation. We are immensely positive about Bedford as a location, its connectivity via the A421 to both the M1 (J13) and A1 (Black Cat Roundabout) offers real choice for prospective occupiers”. Adroit Real Estate Advisors have been appointed jointly alongside DTRE. Further information on the properties being developed at Bedford Link Logistics Park can be found on the AREA property search page or on the dedicated Bedford Link Logistics Park website.